I wanted a “belly” costume for my daughter who wasn’t yet walking. I made the snail shell out of strips of fabric sewn together and stuffed with batting. I then rolled it up and stitched it so that it would stay in a roll. I then affixed some Velcro to the shell and to the back of a green pj so that the shell could come on and off. I added a pink tummy detail to the pj by gluing a patch to the front of the green pj. I then made a hat out of baby blanket I picked up at the dollar store. I used wire and foam balls to make the “eyes”. The whole thing was really comfy for her to wear as it was basically a pj. She loved it! 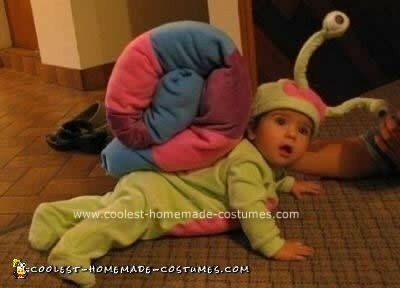 probably the cutest costume ever!